Here we are again in Maryland. It’s late, and I really should be asleep as the melee that is The Maryland Sheep and Wool Festival begins early tomorrow. I’m fortunate to have a great group of women helping me again this year and set up was a breeze. Nice to have ten hands to help with the work. Lil’s here, so the occasional ratchet was thrown into the mix, but it really was a very relaxed set up. We actually had time to wander around the fairgrounds before the show begins, a true rarity. One of the job perks. It’s so nice to see familiar faces, new things, and see the great random animal, especially without the crowds. This wee bottle lamb was helping it’s caretaker put together spinning wheels. Well, until we showed up and had to pet it. Seriously. Ah- dorable. If you’re in the area, stop by. I’m in building #2, booth number 8. Here’s a link to the festival map so you can plan your route! 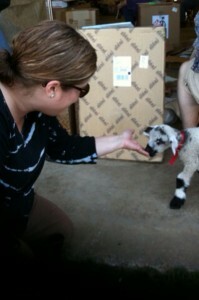 This entry was posted in Uncategorized and tagged jenniethepotter, lamb, MDSW, shows on April 30, 2010 by Jennie.